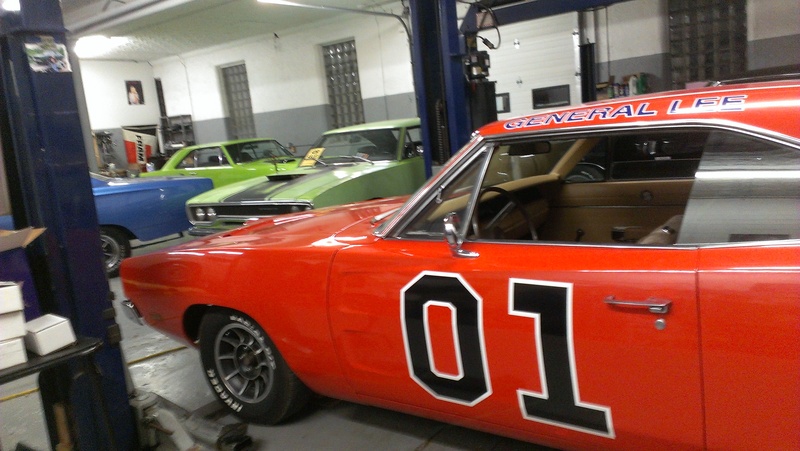 One of the newest additions to the R/T Garage is this General Lee. We found it southwest of the Belle Plaine area in farm country. Here are some photos of when we got it started after years of sitting. It was great hearing it come to life. The owner, who’s a very nice guy, was ready to move on, but his eyes lit up when the General started and he heard the horn again. Troy, of course, fixed some things quickly to make it run and drive even better. Now we park it in front of the building and many people like to stop and take their pictures next to it. It’s a fun draw for the shop. The first night we had it out and parked along the side of the building, the local Belle Plaine police were doing their rounds to check buildings, and we noticed them all gathered around the car with their flashlights. Our finest also enjoy these cars! Being that we owned a “real” movie General Lee from the 2005 Dukes of Hazzard movie with Jessica Simpson, it’s great to have one in the shop again.